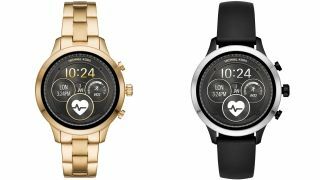 Last week we heard of the brand new Fossil Q Explorist HR and Q Venture HR, and now we've just heard of some very similar upgrades to sister brand Michael Kors' smartwatches with the brand new Access Runway. The Michael Kors Access Runway is more exercise-focused than the fashion watches we've seen in the past, thanks to the introduction of heart rate tracking and GPS to track your location without the need of your phone. It's also swim-proof, so you'll be able to take this watch into the pool to track your stats there. It will work safely in water at depths of up to 3 meters. Unlike previous Michael Kors devices, you can buy this one with silicone straps that will be more comfortable to wear when you're working out and sweating. The Access Runway comes with the latest Wear OS software on board, and that means you have access to Google Assistant, so instead of using the display and buttons to interact with the watch you can now also use your voice to ask questions. You can also make mobile payments from your wrist with Google Pay. There's a round touchscreen display on the front of the watch, but we've yet to learn the exact size or resolution of the screen. It looks similar to that which was included on other smartwatches from the brand though. As for battery, Michael Kors anticipates this watch will last you a whole day but it's unlikely to do much more than that. It has a 300mAh battery inside, and you can recharge it with the magnetic charger in the box - it doesn't use wireless charging. Michael Kors has yet to confirm what's powering the Access Runway, but we'd assume it will be the Qualcomm Snapdragon Wear 2100 chipset that's inside a lot of watches like this. There are nine styles of the watch, with it coming in gold, silver and rose gold for the watch body, with a variety of different straps up for grabs. There are stainless steel strap choices in those colors mentioned above, as well as silicone bands in purple and black. If you live in the US, you'll be able to buy the Michael Kors Access Runway from select retailers on August 13 while the UK will get it before the end of August this year. We don't currently know what other markets it'll be coming to. Pricing-wise it's set to cost $295 / £269 (about AU$400) for a silicone band while the stainless steel bands cost a bit extra with the price reaching $350 / £349 (about AU$480).